On Wednesday the 24th of October 2012, Richard M Jones, the sales manager for Tactical Safety Responses Limited, the sole UK distributor for TASER weapons, visited me at my home in Cambridge. Richard Jones had told me that as someone who regularly comments on UK Police TASER use he and his company wanted to help make sure my comments are well informed. I was prepared to listen and was interested in learning more about TASERs. Another aspect, and perhaps motive, of making contact with me appeared to be making clear that Tactical Safety Responses Limited monitors what people say and write about TASER and that they are keen to take action against those who put a foot wrong. Examples of pitfalls commentators might stumble into include giving an impression deaths and injuries are directly related to TASER use when there is an alternative explanation. The company may also seek to act against those calling non TASER branded electric shock devices “TASERs”. My view, which I expressed, is that the the company risks damaging its reputation if it is seen to be trying to restrict public debate on TASERs. Richard Jones was already aware of the infamous antics of Portakabin™ Limited. Mr Jones, who previously ran a media monitoring business, told me he regularly got in touch with newspapers in relation to their published stories on TASER. One of those I was given the impression Mr Jones and his company are watching closely is campaigner Sophie Khan. One of the new TASER products Tactical Safety Responses Limited are currently trying to sell to the UK police is the TASER X2. Mr Jones brought a TASER X2 for me to see. What he brought was labelled “Laser pointer only”, he told me it was not a live device and contained dummy cartridges. He told me his company were only able to import them for supply to the Home Office and not, as yet, anyone else. The LASER pointer element was demonstrated on my living room wall; this new TASER has two red-dots, rather than the single red-dot of the TASER in use by the UK police. It was explained to me that this is designed to help users of the weapon determine where each of the barbs is going to end up; eliminating one of the more challenging elements of TASER training as officers currently have to estimate where the second barb will end up. There are a number improvements in the X2 over the X26; the cartridges containing the barbs are more enclosed and less at risk of being damaged or knocked off. The device can also be “arced” as a show of force with the cartridges in place whereas currently I was told the cartridge has to be removed from the TASER to enable it to be arced or used in direct contact with an individual in so-called “drive-stun” mode. The X2 is contains two cartridges; with two barbs each. Mr Jones told me there were various ways to programme the weapon, including a “semi-automatic” mode and a mode where the second barbs are fired automatically if the first ones don’t make a connection. He said they were a development of a TASER product designed for use on fast moving animals. The auto-firing function worries me. This led to me asking about how TASER weapons used by the UK Police are programmed; I asked if they were restricted to give only five seconds of shock. I was surprised to be told no, while the devices time how long a shock has lasted, an officer can keep shocking someone for as long as they like (as long as the battery lasts, which is many many times in excess of 5 seconds). Mr Jones explained this was an officer safety protection, and argued it would be dangerous for a police officer to take away the option of re-shocking or continuing to shock an individual who got up again after being TASERed. One other feature of the TASER X2 is that if any two of the four barbs make a good connection with the body of the target individual the current can be routed between them. I was shown the timer which counts up to show the user of the TASER how long they have shocked someone for. I asked about what information was recorded by the TASER and if it was just the fact it had been used, in what form (ie with barbs or without), and for how long. Mr Jones told me the device recorded a lot more than that; but he wasn’t allowed to tell me exactly what. Following my asking he said there was no removable memory card or similar and weapons involved in controversial cases were recovered to one of two TASER owned computers, one of which is in the Home Office, where special software is used to extract data. I was given the impression, that something along the lines of a voltage / resistance trace over time is downloadable from the X26 which can then be analysed to see if the barbs made good contact, and to an extent what effect they had on the individual and for how long. Mr Jones did say the data allows investigators to determine if neuromuscular incapacitation took place or not. If the data extract is controlled by TASER; is that appropriate? Is there assurance of the quality and independence of evidence obtained from TASER devices so it can be used in courts. Are independent expert witnesses available who have been given access to all the hardware and software involved in the evidence chain? Mr Jones brought along the TASER CAM – which can fit in a new battery back of existing TASERs. (TASER also make a head mounted camera, and one of those was demonstrated to me too). Mr Jones wants to sell these cameras to police forces; and would like me and other commentators to be calling for their use – to improve oversight of police use of the weapons. I heard from Mr Jones something I’d heard before – that Firearms officers are generally cautious, and oppose, the use of cameras on the grounds they only show part of the story and can amount to incriminating evidence in cases where an appropriate judgement has been made; however other police officers are generally more open to the use of cameras thinking they can protect them against unfounded complaints or even criminal charges. I am aware, and concerned, that cameras rarely tell the full story, and if we are to have TASER cams; or police cameras more generally, in wider use then courts and jurors need to be well versed in the potentially unreliability of this source of evidence. There are also privacy issues; if the police TASER me is it really fair if the video becomes available publicly on YouTube or is used as television entertainment, I’d say not. The UK police are a significant customer; we should be demanding the highest quality equipment. Many cameras are now constantly recording; and are able to save footage and audio from a short period running up to the record button being pressed; this kind of technology should be used in relation to TASERs. If we are going to have TASER Cams in the UK we need appropriate routes for their footage to be obtained and reviewed. In Australia we’ve just seen what happens when this is not in place, the latest release of videos and calls to tighten up procedures only came about because the ombudsman decided to have a look through the archive of footage which had been amassed. Solicitors, and even judges and magistrates (who have a role in ensuring a fair trial), need to be aware of the availability of TASER Cam evidence (and other data recorded by the weapons). Mr Jones was reluctant to talk about the past and what he (technically accurately) called “the previous company”, Pro-Tect Systems Limited. He did however claim that the failure in the Raoul Moat case was merely a technicality. He said that the problem was not the carriage of the TASER X-REP (Shotgun TASER cartridges) by one individual alone (as appears to have been generally assumed and reported) but that terms of Pro-Tect’s authorisation under Section 5 of the Firearms Act 1968 specified the maximum number of weapons which could be carried by one individual (5) and that limit was what had been exceeded. Authorisations under the Firearms Act are not pro-actively published, and my request for the current authorisation was refused so it is impossible to know what requirements were actually placed on the company. Mr Jones also complained a bit about the restrictions imposed by the authorisation; he said he’d on occasion had to sit in a van to accompany a delivery. He noted that the restrictions did not apply to the police; so a police officer can, and officers routinely he said do, put a large number of weapons in a car and travel with them, on their own, across the country to deliver them to TSR Limited for servicing. What do they do if they need to stop to use the toilet on the motorway? Mr Jones noted that it wasn’t just TASER the police had lax rules and practices on driving around the country with, but other weapons too, he mentioned “rocket launchers” but I suspect he may have been exaggerating. While nothing specific was mentioned; Jones did say that some airlines now routinely carried TASER weapons and had trained their crews to use them. He said he wasn’t able to go into any detail and say for example which airlines, or if there were TASERs on flights operating in and our of the UK. While he was with me, Richard Jones’ mobile phone rang. His ringtone was the sound of a TASER arcing; which is quite a startling sound when it happens when someone who sells TASER has just brought a box of kit into your house! Mr Jones saw me note his ringtone on my pad of paper and asked me not to tweet and write about it. I’m happy to discuss things with anyone in confidence, and never breach such confidences; however that doesn’t in my view apply to Mr Jones’ ringtone (I have maintained confidences in relation to aspects of things we have discussed). I think it says a lot about the type of people we’ve got bringing TASER weapons into this country, trying to sell them to our police forces, and being responsible for distributing and servicing them. Mr Jones arrived dressed in black jeans, and a black t-shirt with a TASER logo, he said he’d just been TASER training with the police in London. Mr Jones told me he didn’t like me calling the TASER weapons “weapons”; he said they were not weapons but “devices”. Mr Jones gave me a TASER pen – nothing special just a promotional biro. I was also offered me the opportunity to be TASERed, if I was prepared to visit the USA to do so. I declined. He also though said he could try and arrange it for me to observe Cambridgeshire Police’s non-firearms police TASER training, and I said I would be very interested in observing that. Lastly, I was told Tactical Safety Responses Limited would be interested in buying the Taser.org.uk domain from me. No sum was mentioned, but Mr Jones suggested I should give any sum paid to charity (I didn’t understand why!). I said I’m not particularly keen to sell it. I’m still chasing the Home Office and asking them to publish the latest statistics on the UK Police’s latest use of TASER; the latest official statistics appear to be for the period to March 2010 : Main article, latest update. My concern is the state are trying to make these figures non-newsworthy and out-of date via the delay in releasing them. 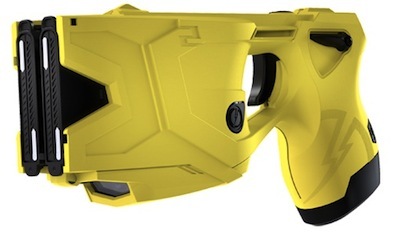 Information on the TASER X2 from the manufacturers TASER International – among other things they say it can hold up to six barbs. This entry was posted on November 6, 2012 by Richard Taylor. Richard – this is an amazingly informative article and makes me wonder why there is not more openness about these weapons, and they are weapons. I am amazed that the Taser rep denies them being so, and I for one, am much happier with them being used than a firearm. However, I would not want to see them issued to any other than specialist police officers. I also wonder at his refusal to discuss data. Surely the more his company can demonstrate the non lethal aspects of the Taser the better? Thank you for publishing the article. I am yet to hear what any of the candidates for Police Commissioner think about their use. I understand there is to be a “husting” on Radio Cambridge on Thursday Morning. Thanks for a great and balanced article on this emotive subject. I am concerned about the innovation of the double cartridge which can shock between any two barbs. Doesn’t that mean that a shock can be applied across the heart, worst case, and if so have any safety evaluations of this been done and published? Richard: Well done. I am perturbed by the use of the camera – more specifically police objections to it. A number of officers now use headcam footage to support their findings and this, almost by definition, never shows what happened before the police arrived on the scene. The use of cameras in custody blocks (at least in Cambridgeshire) is now universal and routine. I am sure magistrates and judges are bright enough to appreciate what the footage shows, and the limits of the approach. Of course it is a weapon. A pencil can be a weapon in some circumstances and you can cut someone with an A4 piece of paper. But those devices have other uses. The law makes a distinction between carrying an item which could be a weapon (say a hammer or craft knife) from those which have no other purpose (a knuckleduster). I can’t think of any use for a Taser other than as a weapon. What is being suggested? Classroom teachers use the device as a pointer for the screen and overlook any other functions? Absurd! One other thing. Has the company ever presented to the police authority? Or even offered? Who would know? In response to a FOI request I submitted the Home Office have released an example of the data downloadable from a UK Police TASER. The Taser X26 cannot differentiate between a hit and a miss, or whether a cartridge is fitted. It also captures when Tasers are activated during routine testing. This is at odds with what I was told by the TASER sales rep as noted above. 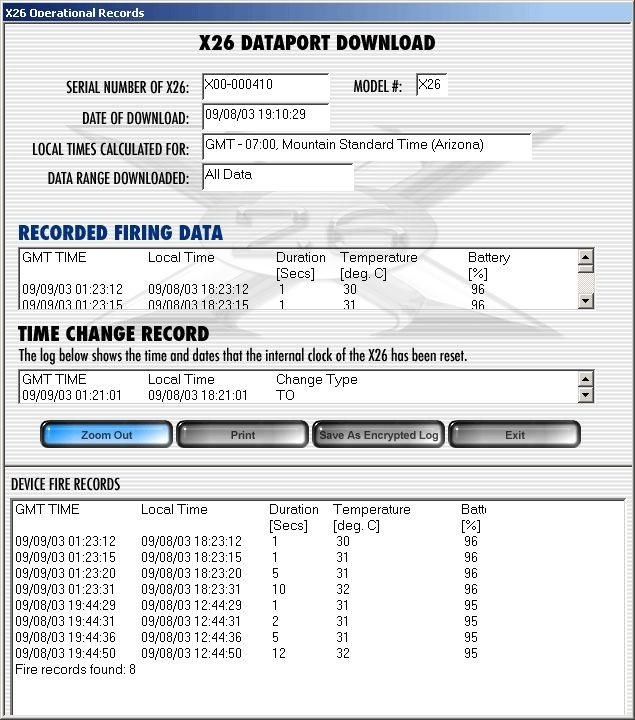 The sales rep was correct the X2 does record if the Taser deployment was a hit or a miss but X2 isn’t issued to the police in the UK however it is being the tested by HMG. The screenshot you’ve been sent is from a X26 which IS issued to police in the UK and can not tell if it was a hit or miss. The above FOI response, which like my statement also relates to the X26, contradicts this. If TASER offered you 50p for taser.org.uk you should take it. It’s a trademarked term and you are using the website in the same class. A simple Nominet DRS and you would undoubtedly loose the domain. Of course I wouldn’t lose a Dispute Resolution Service case over Taser.org.uk – it’s perfectly legitimate to use a trademarked term when you’re commenting on it; to lose a DRS the registration has to be abusive and my use of Taser.org.uk clearly is not; we would have a very broken national domain registry if such domains registrations could be quashed by trademark owners.